A striking difference between science fiction books and films is space battles. In films, such as the latest Star Trek offering (Into Darkness), the space ships are within 'visual' range, and attack each other with particle weapons (as opposed to lasers which would not necessarily be visible) and eventually break through 'shields' and slice up one another. Visually it can be stunning, as in the picture from 'Sacrifice of Angels', my favorite Star Trek (DS9) battle. But is it likely that it would happen that way? Would it be likely that ships would even need to get close to each other? Would space battles really result in the equivalent of a good old-fashioned 'punch-up' with ships and beams instead of bodies and fists? 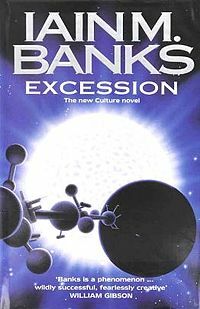 The first time I came across a far more likely - and far more advanced - alternative was with Iain Banks' book Excession. Here, many of the ships weren't manned, as human reactions were inferior to machines, and the battles were fast and furious, maybe involving a dozen ships engaging from various distances in a battle that lasted a second - though a lot happened in that time. This would be difficult in a movie. Imagine you were at a space-training academy sometime, somewhere in the future, learning how to do battle. What would you be learning about? For sure, lasers, particle beams, photon torpedoes, all the nasty weapons, maybe some anti-matter ones too. But these are tactical options. What would be the strategies taught? Probably they would involve using time dilation effects to your advantage, unless someone has developed neat faster-than-light 'jumping' technology, or wormhole generation techniques. 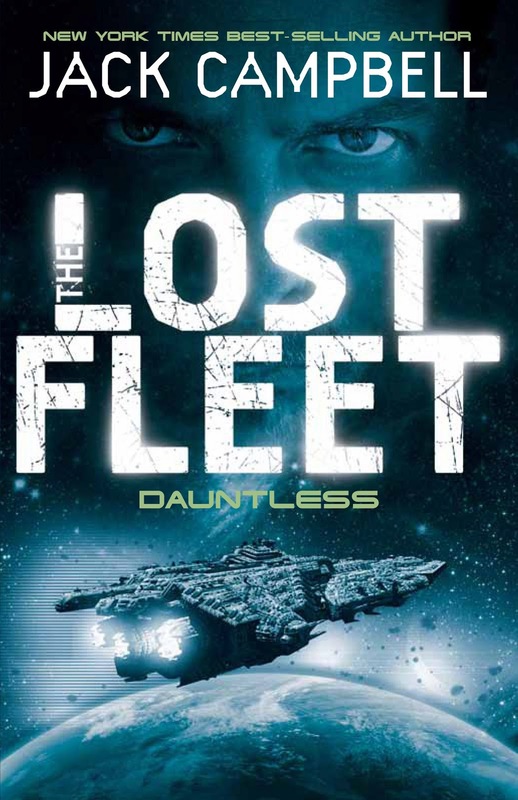 One writer who is good on strategy is Jack Campbell, with his Lost Fleet series. The hero of the series, 'Black Jack' Geary, is often using complex strategies to outwit and defeat an enemy with greater firepower and number of ships. What about using WMDs (weapons of mass destruction) to affect space-time, the 'fabric of space', to throw an enemy off course, or 'mine' their pathway? But wouldn't that damage space irrevocably? This is something I use later in Eden's Revenge, where the galactic war is so intense that 'environmental' concerns are thrown to the solar wind as one side becomes ever more desperate to halt the others' progress. But strategy, as in the forthcoming Ender's Game film, and the book by Orson Scott Card, which is all about strategy, is knowing your enemy, and accurately predicting their intentions and actions, and luring them into a vulnerable state. This is what can make it more interesting, whether in book or film, because it becomes a game of character. Even when humanity is up against an 'unknowable' foe, for example in Greg Bear's (awesome) Hammer of God and Anvil of Stars duology, the strategies employed by the human survivors, particularly in the sequel Anvil of Stars, are what make it fascinating and engrossing, even though the enemy is never 'met' right until near the very end of the book. Eden's Revenge is a 'war-within-a-war', where humanity is trying to survive a 'local' attack in the midst of a galactic war. 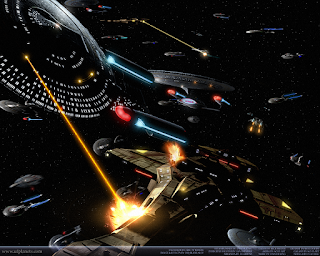 There are plenty of space battles in this one, from one scene involving dozens of ships including some from a different galaxy, more 'organic' than 'tech', to one battle involving a lone pilot trying to disable an intelligent planet-killer missile while he is being slowly killed by its radiation. It isn't a comedy - you got that already, right? But in strategy, part of the 'lure' to get your opponent into a vulnerable or at least 'attackable' position, is to make sacrifices. I used to play chess, and most of my strategies involved sacrificing a high-ranking piece, often the queen. It isn't easy to do, even when it's just a game. Strategy involves sacrifice, and that makes it personal to the player, sometimes intensely so, when to them it is no longer a game (see Iain Banks' Player of Games or Consider Phlebas). This intensity is what makes fiction, whether books or the silver screen, worth spending time on. Anyway, the following is an extract from early on in the book. It is actually an annual simulation 'duel', being watched by the local population in a dome. But for social reasons, winning this session is very important to both 'players', Micah and Gabriel, and critical to humanity's future. Micah found himself on the bridge of an Axion Class Battlestar, orbiting dust-brown Esperia with its Spartan patches of malachite – the great lakes – overflows from the planet’s underground oceans. A small patch of light indicated the twin cities of Esperantia and Shimsha. Micah winced – they looked so fragile from up here, such easy targets. His data-screens told him he had six Blaze Class Destroyers, a hundred single-man Reapers, and four thousand remote Shuriken drones at his disposal. Defence, he gathered. Which meant Gabriel would be leading a simulated attack on Esperia. Micah eschewed the standard strategy of arranging his resources in a defence grid around the planet and moon; Gabriel was far too smart. In such a tactical battle, with Gabriel’s heightened reflexes, Micah would lose. “Long range,” he instructed the bridge comp, then studied the unfolding hologram. Nothing. No sign of Gabriel and his genetically advanced crew. He knew people back in the dome could see avatars of him on the battle-bridge, Gabriel on his ship, wherever it was, and the general situation on a star-field map, along with a digital score of the number of remaining ships on both sides. Custom was for each opponent to talk through his thoughts, but Micah didn’t feel like talking today, and the taciturn Gabriel habitually flouted that particular tradition. Micah had anguished for months over what he was about to do, had almost decided against it. He despised any form of cheating. But he knew that politically – a word he grew to hate more with each year of his Presidency – he could not afford to lose this match; it would destabilize everything just when they were most vulnerable. Besides, the information from the program would only give him an edge, nothing more. Gabriel was still a formidable opponent. Micah instructed his resident to activate the search program he’d installed the night before into the simulation software, using Presidential access codes, and waited. Within seconds a set of coordinates appeared, and Micah did all the necessary calcs in his head, assisted by his resident. Leaning forward in his command chair, he tapped in a set of commands, then sat back and steepled his fingers. Two of his destroyers peeled off and took up position on the other side of the larger of Esperia’s two moons. The other four destroyers blinked bright then vanished into transit, the arrowhead-shaped Reapers and three quarters of the Shuriken – spherical drones spiked with laser turrets – following in their wake. The remaining Shuriken streaked out of Esperia’s system. He imagined the consternation in the dome; it appeared he’d left Esperia almost defenceless, and he couldn’t know from which direction Gabriel would attack. Except that he did. He stared at the screens, then walked up to the bridge’s starmap holo and moved inside it, so that his eyes were close to a particular star, as if inspecting it. Micah knew he was giving the game away. But he’d decided that if he was going to cheat, he was going to be honest about it. He wondered if Petra was out there somewhere, watching, and whether she would hate him for cheating, or, being a Genner, be impressed. Reluctantly he realized that of all the people who would judge his performance tonight, her opinion mattered most - and Sandy's. Petra leaned against the dome’s rear wall, hands sunk into dungaree pockets, observing everything from a distance. With her genned eyesight she had no need to be up front, easily able to pick out the stars and the expressions on Micah or Gabriel’s closed-eyed faces. She gazed across the seated crowd, all of them bent forward, eager to see the outcome; a lot was riding on this particular game. As for her, she didn’t care who won, but she didn’t want either of them to lose. She switched back to the holo-screen. Gabriel’s small attack force of sixteen ships arranged themselves into formation, his hundred-metre-long, javelin-shaped Starpiercer in front, encircled by three waves of five single-pilot, delta wing Hawks. The overall effect was of a skeletal bullet. The ships winked out as they entered Transpace on an attack vector towards Esperia that would take a minimum of two jumps. Inside the dome, chatter subsided as everyone watched Micah’s avatar saunter over to where Gabriel’s fleet had been moments before. Four Youngbloods rose to their sandaled feet, shouting first in their own language, Hremsta, then in English. But for once the Steaders needed no translation. Petra felt the temperature rise in the throng. She studied Micah’s simulated face. He’s doing this on purpose. A crooked smile spread across her lips. “Sneaky, Uncle,” she said to no one in particular. Her smile faded. “Mum would have been amused.” But she noticed a couple of the Steaders were now on their feet, too, shouting back. Brandt, one of her fellow Genners near the front row, a Youngblood nicknamed ‘Hulk’ due to his size, caught her eye. She used the face-code Genners had developed as kids so they could communicate without their Steader parents knowing, to tell Brandt to cool the Genners down. Brandt gave the barest of nods, then turned back to his friends, clicked a command, and his colleagues silenced themselves in an instant, regaining their seats. The two Steaders who’d got up looked pleased with themselves, and with much fuss regained their seats. The bridge shot of Micah receded to reveal an open section of space, halfway to Esperia. Gabriel’s golden attack fleet burst into the space just as two of Micah’s vermillion Blaze destroyers popped out of transit and opened fire. Petra had studied enough of transit hyper-maths to know that two ships on a converging vector would both be pushed back into normal space-time by their bow waves nullifying the warp effect, like two waves colliding and cancelling each other out. But what was Micah playing at? In a straight, evenly matched fight, Genners always won against Steaders. Gabriel’s fifteen Hawks dodged the much larger Blaze destroyers’ particle beam sweeps, even when Micah’s simulated generals used coordinated lattices, but the Hawks couldn’t get close enough to fire. Petra figured it was a matter of time before one or two Hawks would be hit. But then Gabriel’s Starpiercer shot off at an angle, as if running away. One of the Blazes turned in pursuit, and Petra saw what was coming. “Nice one, Gabe,” she uttered under her breath, as his ship spun around and micro-jumped, evading the beams and punching straight through both destroyers’ hulls. Every Genner, Youngblood or not, was on their feet yelling and whooping. Through the melee, she regarded Micah again. He hardly followed the battle. What are you up to, Uncle? She sighed and walked forward. Small as she was, the runt in the Genner litter as she called herself to save everyone else the trouble, she made her way nimbly towards the front, a little to the side. She watched Gabriel’s beautiful face, calm as marble, blond locks tumbling down to his shoulders. Virginia, Gabriel’s tall, tawny-haired girlfriend, glanced in her direction, so Petra switched instead to staring at Sandy, Gabriel’s mother, and her partner Ramires. Though Sandy held Ramires’ hand throughout, and cheered along as Gabriel’s forces outwitted Micah’s, Sandy’s eyes often flicked towards Micah’s inert face. Although Petra was a natural at reading people, she couldn’t work out what was going on behind Sandy’s eyes. Gabriel’s ship and his Hawks winked out – not bothering to engage Micah’s foundering destroyers – for the last transit toward Esperia. She had no clue how Gabriel would face down an Axion Class Battleship with a Starpiercer, but knew he must have a good plan. His Hawks could take out the Reapers, even though they were outnumbered six to one. Petra’s gaze again swept over the expectant faces in the dome. Everyone knew what was hanging in the balance. Gabriel wanted to hunt down the Alicians as soon as Quarantine came down. Micah had said for years that they weren’t ready, but she’d heard that some of the Council members were wavering as the end of Quarantine approached. If Micah lost this simulation, there would be more defections towards Gabriel’s ambitions, represented by Ramires in Council. Colonel Vasquez, the militia commander, would never vote against Micah, but others could be persuaded. She and her fellow Genners outstripped their human parents on every parameter and desperately sought their own destiny, their freedom. Technically, no parent could force their genned child to do anything, nor win any argument with them. But emotionally – though branded even by their parents as cold fish – the Genners needed the stamp of approval from their elders. Most of all, though few would care to admit it, they needed it from Micah, who had continued to win these matches against the odds each year. She hadn’t expected Micah to cheat, though. Maybe it was for the Steaders; they needed Micah to win, to remind them they weren’t obsolete. The day Gabriel beat Micah would be the beginning of the end for ordinary folk. Added into the mix, the Steaders wanted to hang onto their kids, especially since the Alicians had already robbed them of so much. But as she gazed at her Genner colleagues, her friends, she knew it was time, time for their parents and Micah to let them go. She gazed toward the stage, to the two inert figures, settling on the younger one. Come on Gabe! Petra was just wondering where Micah’s drones had gone, when she saw Gabriel’s fleet drop out of transit again, approaching something that looked like a mist. Uh-oh. Five Genners were on their feet again in loud protest: not only did Micah somehow have Gabriel’s flight plan, he was actually tracking Gabriel in Transpace – which wasn’t technically possible, even by cheating. But it didn’t matter for now: the rule was, once the simulation started, it was played out till the end. She watched as a silver hail of drones raced towards Gabriel’s fleet. But soon the Genners were cheering Gabriel’s Hawks on as they raked across the frontline of drones that should have torn them apart. His five lead Hawks pinpointed the laser-armed Shuriken, despite the drones’ erratic avoidance manoeuvres, with amazing speed and accuracy, as if the spiked mines were drifting in space. The Hawks doused them with rapid pulse fire, lighting them up like fire-crackers. Hundreds of spheres winked out of existence, the digital scoreboard for Micah’s diminishing resources blurring in an effort to keep up. As the five lead Hawks’ beam weapons overheated, they peeled back, allowing the next five to push through seamlessly and open fire. Gabriel’s Hawks kept up this rotation for a full minute, destroying more than half of Micah’s drones. Petra noticed even the hard-liners amongst the Steaders were impressed with their genetically-enhanced offspring. Valiant as the Hawk pilots were, however, the swarm of mines began to close around them like an engulfing antibody. A section of drones within the cloud fell behind Gabriel and suddenly attacked the rear wave of recovering Hawks, obliterating three of them before the middle wave could fend them off. There’s too many, Gabe. Gabriel’s Starpiercer veered away from the swarm, allowing the Hawks to shelter on its leeward side, then his ship whiplashed back into the heart of the drone storm, three Hawks in tight formation at its rear. Petra held her breath, thinking this was a suicide run, but Gabriel unleashed hidden cables anchored to his hull. As his ship began to spin, the cable-ends glowed white-hot, flailing outwards, lacerating the attacking drones, carving a boiling corridor through the drone-cloud’s centre. Anti-matter! Way to go, Gabe! Micah watched Gabriel’s flawless performance. But it wasn’t enough. Together with Vasquez and Ramires, Micah had devised these annual games with one sole objective: to train Genners, to ready them for battle. But the odds were always stacked against them, because even upgraded to what Grid Society called Level Four, with a potential to develop to Level Five in generations to come, that’s how it would always be outside Esperia’s small system, out in the Grid. Still, Micah knew he could only hold the Genners back so long. Yet time and again, whilst Gabriel and the others excelled at tactics and strategic planning, they shied away from the tough calls and sacrifices necessary in any field situation. He knew it was because their group was tight-knit and small; Gabriel never wanted to lose anyone. But that was a colossal blind-spot, one an adversary like the Alicians would see and exploit fast. He turned up the heat. Petra heard gasps as Micah’s Reapers appeared in stealth-mode, black shadows against the dark tapestry of space, only visible by the occlusion of stars, engaging the nine other Hawks now on the opposite side of the drone cloud. At first the Reapers were no match for the reflexes of the Genner pilots; in less than a minute half the Reapers were cut down without a single Hawk casualty. Petra managed a subdued punch in the air. Then the dome went eerily quiet as the remaining Reapers did something no one had seen before. If any Reaper got close to a Hawk, it exploded its engines and detonated all its weapons, sending debris in all directions. Because they were dark, it looked as if space was mined, random explosions spattering around the Hawks. Soon five Hawks were damaged enough to slow them down. Petra guessed what was coming. Two Blaze destroyers appeared. Steader cheers competed with Genner expletives as a broiling dogfight erupted before their eyes, particle beams criss-crossing the holo-screen. That was when she detected a shift in the Shuriken pattern and saw the deeper layer in Micah’s plan. She pushed through to the ring, and rushed towards Gabriel’s chair, clicking a command to Brandt above the din. He heard it, and blocked Vasquez’ attempt to intercept her. Virginia’s eyes were steel, but she remained seated. Petra reached Gabriel’s side, noticing a single bead of sweat clinging to his temple. She spoke in clipped Hremsta: “Compression wave; jump now; higher goal,” then turned to the holoscreen, ignoring Vasquez’ glare. The Shuriken were no longer in a loose cloud formation, but were in concentric circles, cocooning Gabriel’s Starpiercer and its attendant three Hawks. The outer sphere of drones flashed blinding white, then the next one followed suit, then the next. It happened so fast, and the light pulses were so intense, that everyone in the auditorium shrouded their eyes momentarily. Two seconds later, darkness flooded back in. Through blotchy vision, Petra searched for Gabriel’s ship, but could only see a vast area of carnage and scorched metal. As the slightly dazed Genner Hawk pilots came out from under their headsets on the other edge of the ring, Vasquez saluted them. A number of other men and women, Steaders no less, stood and followed suit. That’s a first. She turned back to Virginia, only to meet a cool stare, before Gabriel’s girlfriend turned and pushed her way back through the crowd. Petra shrugged, and took Virginia’s seat, and gazed straight ahead. Within seconds, Gabriel’s Starpiercer was thrust out of Transpace again by the two Blaze destroyers that had just eradicated most of Gabriel’s Hawks. Destroyer jump range was farther than a Starpiercer’s, but she still didn’t see how Micah was doing this. How had he been able to track ships in transit, since, after the first encounter, Gabriel must have realised Micah had advance information, and would have altered his next transit vector? She wasn’t alone; both Steaders and Genners were shouting unorthodox and unrealistic tactics. Then she got it. The first two destroyers must have tagged Gabriel’s Starpiercer, probably via coded micro-debris from their hulls clinging to it when Gabriel tore through their hulls. Not for the first time, she wondered how Micah thought like a Genner. This time Gabriel did not turn to fight, and instead bore onwards into a nearby solar system, unable to pull away from the closing destroyers. The three remaining attendant hawks, knowing they would hold Gabriel back from reaching his maximum speed, bled away from the Starpiercer and headed back towards the lead destroyer. But it was futile – they were incinerated in the beam-fire before they could inflict any damage or even slow down the destroyers. Gabriel aimed straight for the sun. 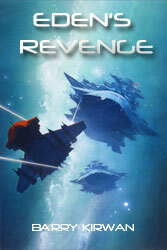 It had been a hot discussion topic with the Ossyrians as to whether the Starpiercer could really live up to its name. Petra twisted around for a moment, noted that the entire audience was on its feet, eyes glued to the chase scene. She joined them. As Gabriel approached the point of no return, with the destroyers almost in firing range, he wavered to the left, then swung right, accelerating into a hard curve. The destroyers had momentarily adjusted direction to catch Gabriel, and now had to swing back. But they were less manoeuvrable, and laboured hard to make the course correction. All three ships skated along the lick of the sun’s corona, and Petra could only imagine the stresses on the hull and engines. Gabriel’s ship jettisoned all its cables. The lead destroyer caught several of them, atomizing the front half of the ship and flinging fireballs into the tandem destroyer, tearing off one of its engines, sending it careening down into the sun. Gabriel’s ship pulled away, and then jumped back into Transpace. Unanimous applause broke out, but it sputtered as a quadrant of the star-field shifted, as if there had been a glitch in the holosim. Not everyone had seen it, but as the noise died down, two ugly black scars, rips in the fabric of space, opened up some way out from Esperia’s sun. All eyes darted first to Micah’s avatar returning to his battle chair on the bridge, then to Gabriel, who, in his last transit, was oblivious to something that had happened ahead of his ship. Petra couldn’t warn him this time, not while he was in transit. Petra realized she had really hoped Gabriel would win this time. The Genners had earned it; deserved it. But Micah obviously had one more trick. She did the hyper-maths in her head to predict where Gabriel would drop out of transit. Even before she finished the calcs she’d been able to do since seven years of age, she knew where he would arrive, and glanced towards the two remaining Blaze destroyers on the other side of Esperia’s larger moon. People quietened down as the holo zoomed in for the final showdown. If Micah had miscalculated by even a fraction, Gabriel would have had his target right there in front of him, with only a single battleship to fight. But she knew Micah hadn’t faltered, his strategy had been orchestrated with ruthless precision. Petra folded her arms, and stared at her adopted uncle, realizing she didn’t know him as well as she thought. The two destroyers began blasting a focused beam on the moon’s surface, interspersed with ‘burrower’ nuclear torpedoes. Within seconds, rock spewed forth into space. The destroyers came about. She knew now that Micah had used the remaining drones to explode two black hole mines close to the final transit route, creating a gravimetric shock wave; a ripple, in effect, but one strong enough to divert Gabriel’s transit vector by half a million kilometres. As his Starpiercer leapt back into normal space, instead of having the planet before him and Micah’s flagship in his sights, he met two destroyers head on, gun ports blazing. As yellow beams lit up space, Gabriel hardly had time to detect the dark avalanche streaming toward him from the moon. Pummelled by the rock, his ship was caught in the destroyers’ crossfire. The Starpiercer was sliced in half. A single, space-suited figure ejected from the disintegrating ship, amidst a collective intake of breath by the audience. Petra held herself, then noticed something blink onto the scoreboard; another Hawk had entered the game. She spotted Virginia sitting in one of the dummy simulation chairs on the other side of the stage. Petra turned back to the screen. Just as the destroyers moved in for the final kill, a single Hawk dropped out of transit for a few seconds, then disappeared again, snatching up the avatar of Gabriel with it. Petra smiled. Way to go, girl. She vacated her seat before Gabriel came to, avoided Sandy’s searching stare, and headed toward the exit. 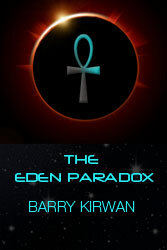 Eden's Revenge is available on Amazon, as are the first two books, The Eden Paradox and Eden's Trial. How many books in a trilogy?